Brooklyn's oh-so-proper future in-laws are traveling from England to meet her, and if that's not enough to set her on edge, rumors abound that the charming Courtyard Shops across the street may be replaced by high-rise apartments. Their trendy neighborhood will be ruined unless Brooklyn and her fiancé Derek Stone can persuade the shopkeepers not to sell. But with a rare edition of Alice in Wonderland causing bad blood at the Brothers Bookshop and a string of petty vandalism making everyone nervous, Brooklyn and Derek feel like they're attempting six impossible things before breakfast. Then the owner of The Rabbit Hole juice bar is felled by his own heavy shelves, and the local cobbler lies dead beside him. An accident . . . or something more sinister? Things get curiouser and curiouser when a second priceless copy of Alice is discovered. Will it stir up more trouble within the close-knit community? As the Brits descend, Brooklyn learns they're not so stuffy, after all. Derek's dad is won over with chocolate cream pie, and his psychic mum would kill to help Brooklyn solve this murder—before another victim takes a tumble. "Truly laugh-out-loud hysterical... With many twists and turns and characters not being whom you expect them to be, this is a great tale of who didn't do it!" "Kate Carlisle dazzles and delights readers with Once Upon a Spine... Brooklyn has shown a lot of growth and development throughout the series." "One of my favorite reads this year!" 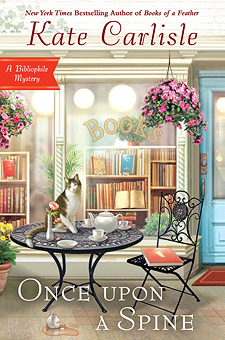 "The Courtyard building, with its collection of small shops adds an intimacy to the story and the murder...Cozy mystery fans may find it a delightful fall into Brooklyn's enchanted world."